If you are currently looking for a way to convert a Google Earth .kmz or .kml tour file to an AVI file or any preferable movie file format (e.g. MP4, MPEG, WMV…), you may wish to read this post. It displays an easy workaround to convert KML/KMZ to AVI, MP4, MPEG, WMV on Mac and Windows PC. KML is a file format used to display geographic data in an Earth browser such as Google Earth, Google Maps, and Google Maps for mobile. KML uses a tag-based structure with nested elements and attributes and is based on the XML standard. KML files and their related images (if any) can be compressed using the ZIP format into KMZ archives. Currently, only Google Earth can play a kml/kmz. No other tool is going to be able to convert it. For those who are not willing to drop money on Google Earth Pro Movie Maker Module, the alternative, that most people who have posted these GE animated travel-tour files on YouTube, etc., have used is a desktop recorder/video capture app that simply records the GE tour playback from the desktop and then makes a video file, like an AVI, MP4, or MPEG. Here’s a quick guide demonstrating the process of turning .kmz/.kml to MP4 video. The software we will use is UFUWare Screen Recorder, a very popular and easy-to-use application that can successfully record .kmz/kml files as MP4 files. Before recording with this screen capture software, you should adjust the recording area first. With this Screen Recorder, you are able to choose the full screen or custom the recording area by yourself. You can click the system audio and microphone to make sure the checkmarks appear. Note: If you are going to save streaming video from YouTube, the music videos, online movies, Netflix or some other sites else, you need to select the system audio and turn off the microphone. Why? Because the noise around will reduce the quality of your video and affect the video effect. By default, this Recorder app outputs WMV video. To record .kmz/kml files as MP4 files, you need to click settings button and select MP4 as output format. You can also click ‘General’ option to set the location of output files. After setting the recording area and audio, you need to open the .kmz/.kml file which you want to record with Google Earth. Then click REC on the right side of this video screen capture to begin recording. Step 6. Click the red pause button to stop recording. Now you have finished the screen recording process with this desktop recorder. You can find the generated MP4 video in the output folder easily. How to convert recorded KML/KMZ(WMV/MP4) files to AVI, MPEG on Mac/PC? The Screen Recorder app saves recorded files in WMV or the widely accepted H.264 MP4 format. If for any reason you need to convert recorded KML/KMZ files (WMV/MP4) to AVI, MPEG or other formats on Mac/PC, you can download and install UFUWare Video Converter for Mac or Windows below to process format conversion. Step 1: Run UFUWare Video Converter. 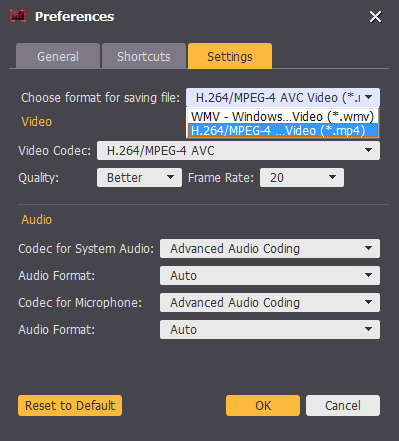 Once the main interface comes up, click ‘Add File’ button to import Screen Recorder recorded WMV/MP4 files. From the ‘Profile’ bar, choose your required file type as output format under ‘General Video’ or ‘HD Video’ column. When ready, click ‘Convert’ button to start transcoding recorded KML/KMZ (WMV/MP4) to AVI, MPEG on Mac or Windows. As soon as the conversion is complete, you can click ‘Open Folder’ button to get the generated files.